“On the fifteenth day of this seventh month there shall be the Feast of Booths to the Lord, [to last] seven days…You shall live in booths seven days…in order that future generations may know that I made the Israelite people live in booths when I brought them out of the Land of Egypt, I the Lord your God” (Lev. 23:33, 42-3). This joyful holiday has been celebrated for thousands of years with feasts and get-togethers inside the temporary structures. Unfortunately I didn’t have an opportunity to set up my sukkah this year. I’ll share a picture of it next year. 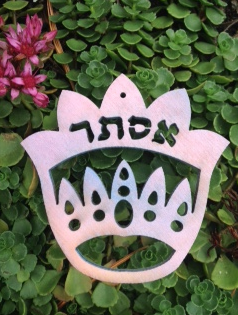 A custom originating with the Lurianic Kabbalah (a medieval mystical Jewish document) “invites” one of seven “spiritual guests” into the sukkah each day of the festival. These guests are called “ushpizin” which means “guests” in Aramaic. Traditionally these ushpizin were Abraham, Isaac, Jacob, Moses, Aaron, Joseph and David and each guest has a spiritual lesson to give on the day they visit. In 1597 the kabbalist Rabbi Menahem Azaria of Fano wrote that seven prophetesses in the Hebrew Bible correspond to seven spiritual attributes of God (sephirot). According to the Babylonian Talmud seven women preached to Israel: Sarah, Miriam, Deborah, Hannah, Abigail, Huldah and Esther. As a later development, the seven women were linked to the seven guests invited into the sukkah. We use the feminine form “ushpizot” to refer to these seven visitors. This practice has not been standardized, so some communities invite a different set of women into their sukkahs than the prophetesses (most commonly, Rebecca, Rachel, Leah, Miriam, Hannah and Esther; Ritualwell has developed a ceremony to welcome these women into a sukkah). I’m quite taken with the prophetesses, so I invite the women who spoke oracles into my hut. Here’s my rendition of a ceremony to welcome the prophetesses. Feel free to use it if you find it meaningful. 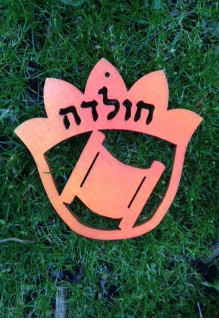 The photos are of the decorations I use in my sukkah to commemorate the seven prophetesses. Happy sukkot! We welcome you, Sarah, who heard God’s voice. From you we learn loving-kindness (hesed). Action: shake lulav to the right. “But God said to Abraham, Do not be distressed because of the lad and your maid; whatever Sarah tells you, listen to her, for through Isaac your descendants shall be named” (Genesis 21:12). Sarah, our holy guest be seated in our sukkah under the shade of the Shekhinah that we may learn loving-kindness from you. We welcome you, Miriam, who sang and danced for God. From you we learn strength (gevura). Action: shake lulav to the left. “Then Miriam the Prophetess, Aaron’s sister, took her drum in her hand, and all the women followed her out, with drums and dances. And Miriam sang to them …” (Exodus 15:20-21). “Miriam, as it is written [Ex. xv. 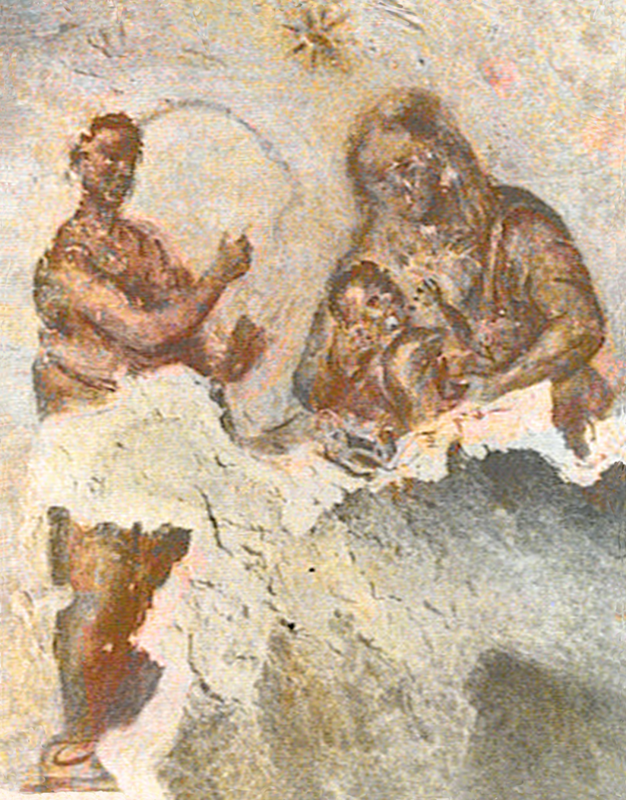 26]: “Then took Miriam the prophetess, the sister of Aaron.” Aaron’s, and not Moses’ sister? Said R. Na’hman in the name of Rabh: She had prophesied even when she had been yet but Aaron’s sister, before Moses’ birth, and she said: In the future my mother will give birth to a child that will deliver the Israelites. Finally, when Moses was born, the whole house was filled with light. And her father rose, and kissed her on her head, and said: Daughter, thy prophecy is fulfilled. Afterward, when he was cast into the river, the father asked: Daughter, what has become of thy prophecy? And this is what is written [ibid. ii. 4]: “And his sister placed herself afar off, to ascertain what would be done to him,” i.e., to know what would be the end of her prophecy” (Babylonian Talmud: Tractate Megillah). Miriam, our holy guest, be seated in our sukkah under the shade of the Shekhinah that we may learn spiritual strength. We welcome you, Deborah, who spoke the truth. From you we learn to appreciate beauty (tiferet). Action: shake lulav to the front. “Now Deborah, a Prophetess… judged Israel at that time. And she sat under the palm-tree of Deborah …. in the hills of Ephraim” (Judges 4:4). “Deborah, great warrior, judge and mother in Israel, your fiery example inspires us to take action. We long to know more of your words and yearn to take your poetry into our hearts and minds. Warrior mother, we need your energy now to sacralize the political and create leaders that embody your prophetic leadership” (Leah Novick, excerpted from Appeal to the Matriarchs). Deborah, our holy guest, be seated in our sukkah under the shade of the Shekhinah that we may learn about the splendor of God. We welcome you, Hannah, who dared to pray out loud. From you we learn about eternity (netzach). Action: shake lulav toward the heavens. “Hannah was considered as a prophetess by Jonathan b. Uzziel. In his targum he thus explains the first five verses of I Sam. ii. as being a prophecy: Verses 1, 2: These indicate that her son Samuel would be a prophet, and that her great-grandson, Heman, the singer, would stand with his fourteen sons among the musicians in the Temple. Verses 3-5: These foretell the rout of Sennacherib; the fall of Nebuchadnezzar and that of the Macedonian kingdom; the fatal end of Haman’s sons; and thereturn of Israel from Babylon to Jerusalem. Hannah is likewise counted among the seven prophetesses in Meg. 14a” (Jewish Encyclopedia, “Hannah”). “…and she prayed to the Lord exceedingly. Hannah spoke devotedly from her heart; only her lips moved, but her voice could not be heard” (1 Samuel 1:12). 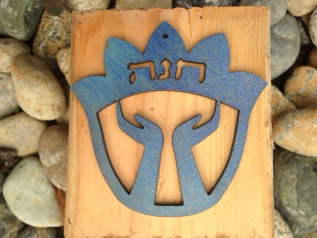 Hannah, our holy guest, be seated in our sukkah under the shade of the Shekhinah that we may learn about eternity. We welcome you, Abigail, who used her wise words to bring peace. From you we learn about the glory of God (hod). Action: shake lulav toward the earth. “Abigail, as it is written [I Sam. xxv. 31]: ‘And when the Lord will do good unto my lord.’ She prophesied that he would be king” (Babylonian Talmud: Tractate Megillah). “[Abigail], forceful woman of Carmel, you foresaw David’s future; feeding and welcoming the outlaw chief when his life was in jeopardy. Becoming his wife in hard times, before he was king and psalmist, you supported the emergence of genius. Clairvoyant mother, send us your insight so we might have the strength to trust and follow our intuitions” (Leah Novick, excerpted from Appeal to the Matriarchs). Abigail, our holy guest, be seated in our sukkah under the shade of the Shekhinah that we may learn about God’s glory. We welcome you, Huldah, who used her intelligence to bring wisdom to the world. From you we learn about that righteousness is the foundation of the world (yesod). Action: shake lulav behind you. “Huldah, preacher at the Southern gates of the Temple, you were consulted on important religious matters, like your cousin Jeremiah. You, whose teaching comes to us in your advice to King Josiah, are needed now. Prophetic mother, help us find the deep learning of enlightenment and peace” (Leah Novick, excerpted from Appeal to the Matriarchs). Huldah, our holy guest, be seated in our sukkah under the shade of the Shekhinah that we may learn about the foundation of the world. We welcome you, Esther, who risked her life for the sack of bringing justice. From you we learn about queenship (malchut). Action: smell the perfume of the etrog. “And Esther, because it is written [Esther, v. 7]: ‘Esther put on royalty.’ It should be written, ‘royal apparel’? That means, she clothed herself in the Holy Spirit, and this is inferred from an analogy of expression; here it is written, ‘she put on,’ and in I Chron. xii. 18, ‘a spirit invested Amassoi.’ As there the Holy Spirit is meant, so here” (Babylonian Talmud: Tractate Megillah). “Esther, gentle queen with premonitory knowledge that propelled you to save your people, whether you are historical or mythological, we are touched by your story. How you must have feared your awesome destiny, overcoming fear with transcendent faith. 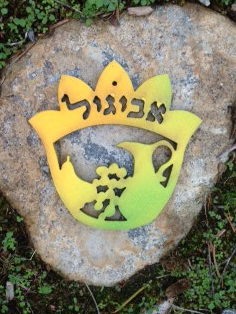 Royal mother, bless us with inner strength to overcome the obstacles that block us from fulfilling our sacred assignments” (Leah Novick, excerpted from Appeal to the Matriarchs). Esther, our holy guest, be seated in our sukkah under the shade of the Shekhinah that we may learn about the royalty of the spirit. Encircle us with the majesty of Your pure and holy glory. Give sufficient bread and water to all who are hungry and thirsty. Grant us many days to grow old upon the earth, the holy land, That we may serve and revere You. Blessed be the Lord forever. Amen, amen. I’m quite taken with Ivoni Richter Reimer’s book Women in the Acts of the Apostles: A Feminist Liberation Perspective. This book will crop up in many of my future blogs but what caught my eye today was Reimer’s comments about “not a few of the leading women of Thessalonica” (Acts 17:4) that the apostle Paul and his side-kick Silas met in the Greek city. She writes: “Paul and Silas’s ‘missionary method’ was the same everywhere: They entered a city and made contact with the Jewish population, going repeatedly to the synagogue and preaching” (p. 245). 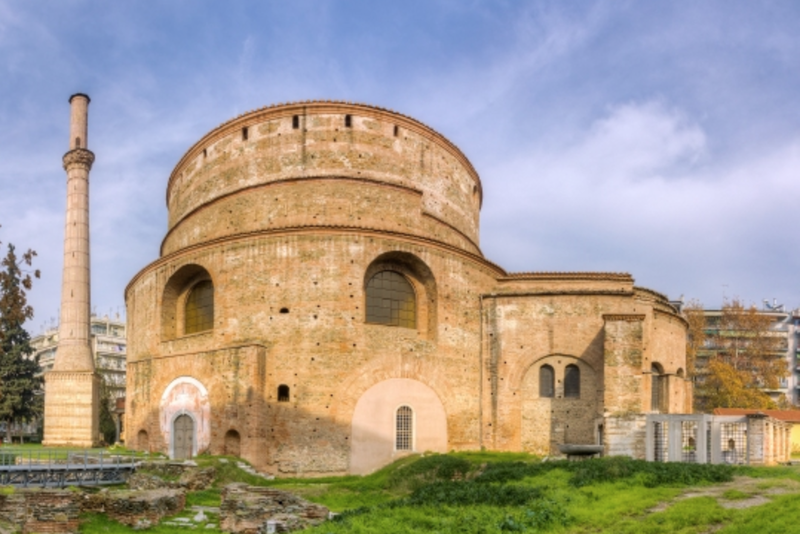 She highlights that in Thessalonica, a city near the Roman colony of Philippi, the missionaries continued this practice. “As elsewhere, a conversion takes place in the context of the synagogue, but a special detail is the emphasis on a particular social group: not a few of the ‘leading women’ join Paul and Silas” (p. 245). This is not the first instance of notable women’s attraction to the teachings of Jesus in the context of a synagogue. Note that at the time of the writing of Acts, the complete divergence between Christians and Jews had not yet occurred. Throughout Greek literature contemporaneous with Acts, the Greek term “leading” refers to “the highest level of society and implies political power and a display of wealth” (Arlandson, p.158). The newly converted women in Thessalonica were therefore “wealthy, powerful, and enjoyed a high measure of political power and social prestige” (Arlandson, p.158). 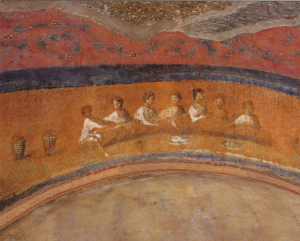 Wealthy women in the first century Roman Empire often controlled their own money, as allowed by law. Financial independence brought them social freedom and leisure time, allowing them to participate in political and religious offices. A number of first century writers note that prominent women participated in a variety of religious cults, particularly in foreign religions from the East. “Such women had the resources and perhaps the necessary personal autonomy to join a new religious movement,” (Kraemer, Women in the Scripture, p. 465). From stone inscriptions we learn that they often donated vast sums to civic organizations, religious institutions and building projects. 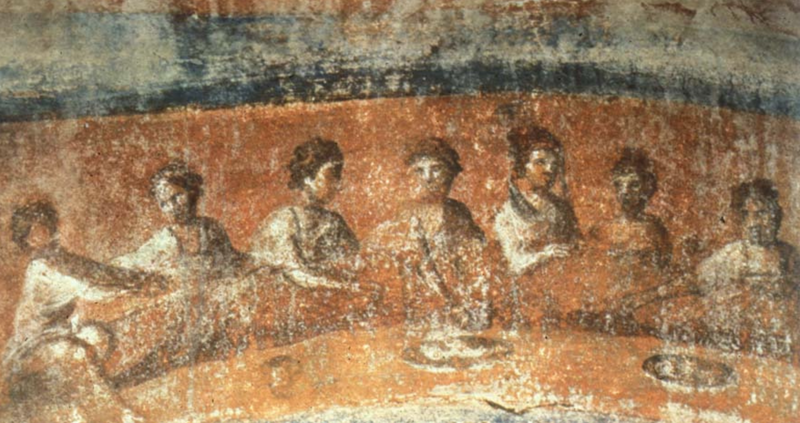 Though Acts 17 doesn’t spell out the leadership duties of the leading women of Thessalonica, it is very likely that they held positions of authority in early Christianity, just as their female contemporaries did in other foreign religions throughout the Roman Empire. Reading about these leading women reminded me of my time in Thessalonica (now known as Thessaloniki). Flying in from Athens, my sister and I disembarked from the airplane and almost the first thing we heard was Hebrew! That should have been a clue, but I was too astounded to begin to understand what that meant. So we proceeded through the ordeal of renting a car that was given to us without gas and the engaging task of finding our way to our hotel where there was no parking. However, as my sister and I walked around the exterior of the Rotunda, we found gravestones inscribed with Hebrew and Jewish symbols scattered like abandoned children’s toys. This was my second clue, but I was still clueless. After visiting Philippi the next day, we drove back to Thessaloniki and made another attempt at finding that dang Jewish Museum. We found the posters again. Woohoo. Defeated, we headed back to the café where we’d drowned our sorrows the previous day. Considering myself to now be a loyal customer worthy of posing stupid tourist questions, I asked the employees where the museum was. Nobody spoke English but through gestures I figured out that their English-speaking owner would arrive in a half hour. Yeah, I’m really good at the non-verbal communication thing. In Israel and Italy I’ve had lengthy conversations with others without uttering a word. When the owner arrived, we discovered that we had not walked far enough down the street. How pathetic was that? We promptly scuttled down the said street and entered an elegant museum just before it was ready to close. This would be a recurrent theme throughout our trip. The museum blew me away. In the imposing building that once housed the Jewish newspaper L Independent, I learned that a huge Sephardic (Mediterranean Jewish) population had flourished in Thessaloniki after being expelled from Spain in 1492. The city provided a tolerant atmosphere where the new settlers flourished with their knowledge of Renaissance medicine, science and other skills. The city became known as the “Mother of Israel” and housed a number of Jewish institutions. By 1940 the Jewish cemetery held 500,000 tombs. With the arrival of the Nazis, 49,000 Jews of Thessaloniki were shipped to the German death camps of occupied Poland. 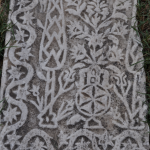 The cemetery suffered a great deal of damage at the hands of the anti-Semites. So to bring this full circle, I have to tell you that some of those Hebrew speakers we overheard in the airport were also at the museum! We could have followed them the whole time and probably would have had a profound engagement with Jewish history. Or perhaps everything worked out just as it should have. Arlandson, James M. – “Lifestyles of the Rich and Christian: Women, Wealth, and Social Freedom,” in A Feminist Companion to the Acts of the Apostles. Amy-Jill Levine and Marianne Blickenstaff, eds. (London: T & T Clark, 2004) 155-170. Arlandson, James M. – Women, Class, and Society in Early Christianity: Models from Luke-Acts (Peabody Mass: Hendrickson Publishers, 1997). Kraemer, Ross S. – “Leading Women Converts of Thessalonica,” in Carol Meyers, Toni Craven and Ross S. Kraemer, eds., Women in Scripture: A Dictionary of Named and Unnamed Women in the Hebrew Bible, The Apocryphal/Deuterocanonical Books, and the New Testament (Grand Rapids, MI: Eerdmans, 2000) 465 -6. Mattews, Shelly – First Converts: Rich Pagan Women and the Rhetoric of Mission in Early Judaism and Christianity (Stanford, CA: Stanford University Press, 2001). Mattews, Shelly – “Elite Women, Public Religion, and Christian Propaganda in Acts 16,” in A Feminist Companion to the Acts of the Apostles. Amy-Jill Levine and Marianne Blickenstaff, eds. (London: T & T Clark, 2004) 111-33. Witherington III, Ben – “Anti-feminist Tendencies of the ‘Western’ text in Acts.” Journal of Biblical Literature 103, 1 (1984): 82-84. From Zugburg, Switzerland we traveled north to Germany to see where Thea’s dad, David, grew up. As an army doctor in the late 60’s and early 70’s, David’s father was stationed at the army base in Landstuhl, Germany. 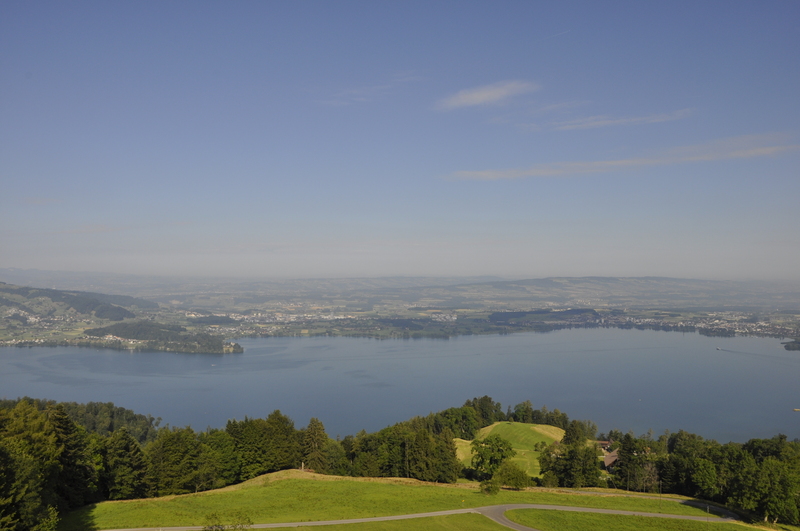 With their interest in horn instruments, both David and his father joined the local church band in the nearby town of Kinsbach. Over the years, the lone Jewish family was adopted by the hamlet and became one of them. When my father-in-law, Jerry, returned to the USA he made arrangements for the band to tour America three times. For his diplomatic efforts, he was given the keys to New York and a commendation from the State Department. Little did they know that they were endorsing a bunch of drinkers with oompah problems. Now the citizens of Kinsbach were not about to be out-classed by a bunch of Americans. No, they had a secret weapon. The entire band and the dignitaries of Kinsbach decked themselves out in their traditional velvet costumes handed down to them for generations. Without explanation, they escorted Jerry and his wife Judy into a horse-drawn carriage which wound its way up the hill to the local castle. During the ride he joked and laughed, thinking this was the best practical joke his fellow band members had ever played on him. Finally the bandleader jabbed Jerry’s side with his elbow and told him, “Shut up. 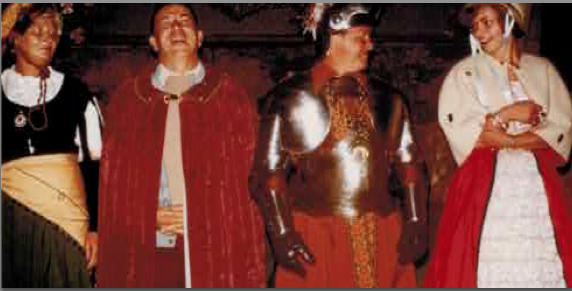 This is for real.” Solemnly, Jerry entered the grand hall of the ancient Landstuhl castle where, with great pomp and ceremony, my father-in-law was knighted. [Excuse me one moment where I search Google for other Jewish German knights. No relevant results.] Is it possible that Gerald H. Cohn is the only Jewish German knight of the 20th century? Of any century? This summer we had the great honor of visiting the old castle, Burg Nanstein, named after the 15-meter high natural outcropping. 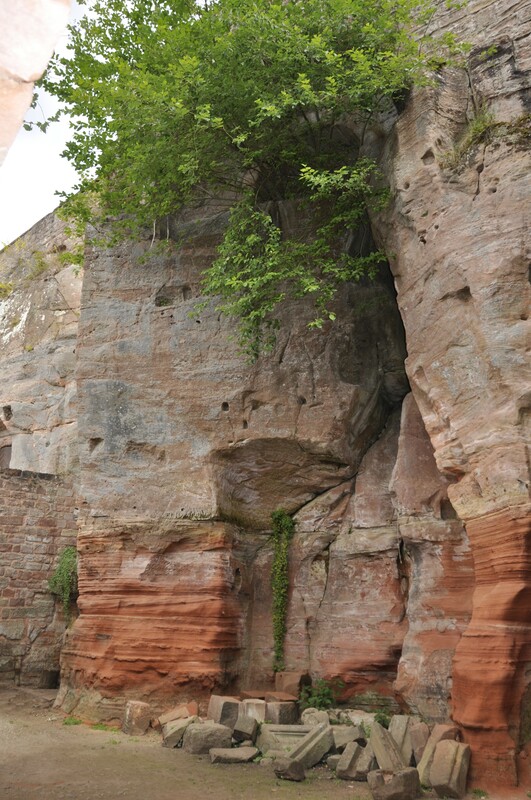 Carved in 1150 out of the sandstone cliffs overlooking the three surrounding valleys, the weathered castle walls are stunning from a sculptural point of view. We ventured into the dungeon where Thea’s dad hung out with his friends as a kid and we saw the rampart he scrambled over when chased by the guards. How cool is that? 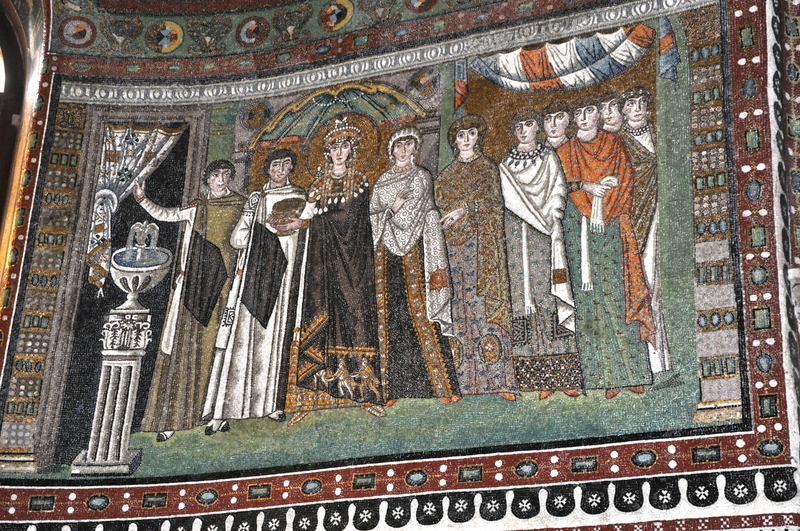 Before leaving Italy we had to see the Last Supper in Milano, of course, and since my daughter is named Theodora, we had to see Empress Theodora’s mosaics in Ravenna. Then we took the long way back to Seattle via Japan and Hawaii. Upon returning to Seattle, finally, I discovered that my website had been hacked. When I contacted my webmaster in Rome, he disclosed that he had been arrested for taking pictures of police brutality. As far as I know, he’s still set for trial and continues to battle it out. I wish him the best. Eventually he waved his magic wand and made everything all right on my website, hence my ability to send out this email! But before I could return to my computer, my father-in-law died in our house due to the complications of Parkinson’s. His wife died in our house almost exactly three years ago. We had a touching funeral service and laid him to rest with soy sauce and beer (what he joked about being embalmed with in honor of living in Japan and Germany). So that’s my excuse for not writing all summer. I hope no more excuses arise because I miss “chatting” with you. 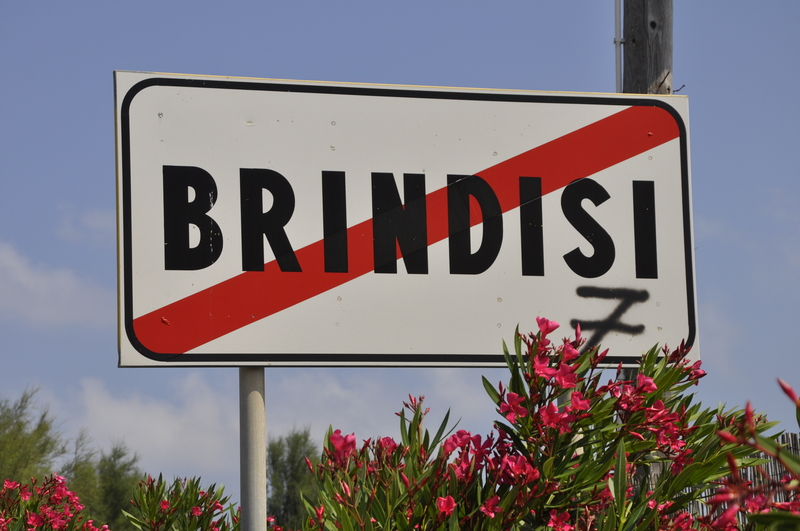 A week before beginning to move back to the States from Italy, I met the other Jew of Brindisi at a party. I’ve lived here two years and just before I leave, I find someone I could have celebrated the holidays with?! Her name is Syd and she’s an American expat who has lived here for eons with her Italian husband and children. We immediately got along. In the short time we spoke at the party, we couldn’t talk quickly enough to learn about each other. In that initial conversation, she mentioned that there was a medieval mikvah (Jewish ritual bath) and remains of a synagogue in the nearby town of Lecce. I couldn’t believe it. I have three guidebooks about Jewish Italian history and not one of them mentioned Lecce. The only ancient Italian mikvah I knew was in Sicily. I have a long abiding interest in mikvot since writing Judith: Wise Woman of Bethulia because the ancient biblical heroine was known for her ritual purification washings. So when Syd offered to show me the ancient Italian site, I dropped all my packing and we drove to Lecce. We were met by Giuseppe Pagliare, a scholar of the Jewish history of Lecce. About a year earlier Syd had discovered him and his work. We were lucky he was available on such short notice to guide us through the old Jewish quarter of the city. Though he is not a “member of the tribe,” Giuseppe is passionate about all things Jewish—he even goes by the Hebrew nickname of Yossi. 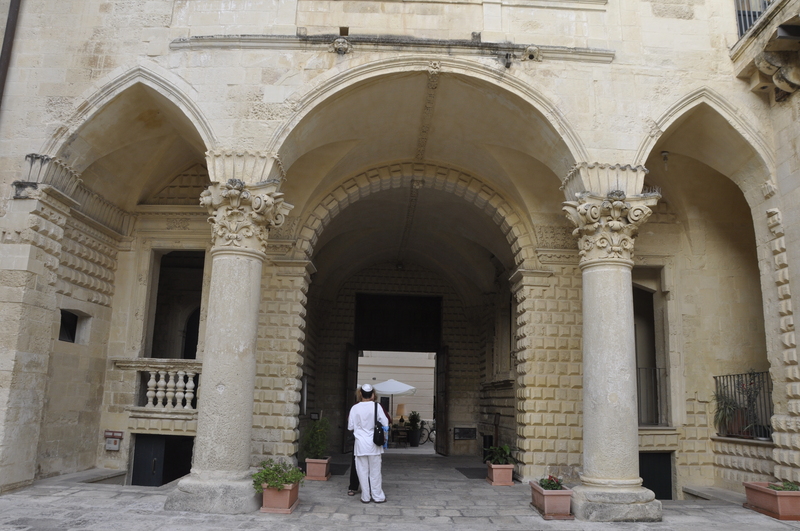 He explained that Lecce, like many ancient cities, is built in layers. With the passing centuries, each new generation built on top of the prior so the oldest part of the city is buried under what we see today. After the Jews of Italy were expelled for the last time in 1541, Lecce grew over the old quarter where they had lived. When new maps were drawn, no trace of the former community remained on record. In time, Jewish existence in Lecce was forgotten leaving behind only a street named Via della Sinagoga (“street of the synagogue”) and a handful of legends. These small crumbs of evidence led contemporary historians to seek out the presence of a Jewish community near Via della Sinagoga. The first breakthrough came in 1994 with the renovation of the Palazzo Adorno just down the street from the church of Santa Croce, the highlight of the baroque architecture of Lecce. 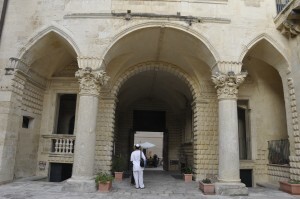 Underneath the Palazzo they discovered two entrances and a complex of rooms “like a city,” Giuseppe said. The various rooms surrounding the mikvah were probably used for a study house and other community related activities. Since the site is not open to the public, Giuseppe made arrangements to take us down into the area now used as a very messy archive. It was here that they broke down a wall in 1994 and uncovered what was later determined to be steps leading down to a large mikvah dating to the time before Jews were expelled for the last time in 1541. I took a picture of a fish swimming in the fresh water. Since the last time Giuseppe visited the site, he learned that most mikvot at the time were designed with at least two pools, one for women and one for men. So this time, armed with the flashlight I’d brought with me, Giuseppe searched for any indication of another ritual bath. 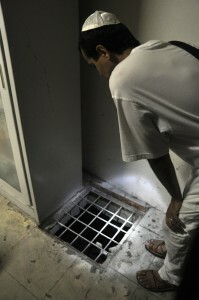 In one of the disorganized rooms, between rusting metal cabinets, we found a grating and peered down into the dark. We saw water below and an inlet channel typical of a mikvah which allows the proper amount of fresh water into the pool for ritual purposes. Of course we couldn’t be sure it was the second mikvah, but given Giuseppe’s experience and knowledge, he said it definitely wasn’t a well. Needless to say, we were excited about the possibility of finding an unrecorded ancient mikvah. I was feeling a little like Indiana Jones at that point! 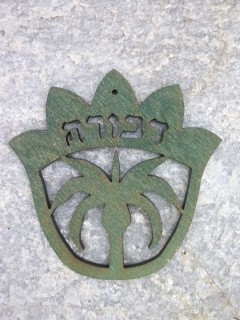 Giuseppe also showed us a stone inscribed with Hebrew which I believe said “bait le ohavei hael” (House for God Lovers). This stone originally identified the local synagogue or the aron kodesh, the place where a synagogue’s Torah scrolls are kept. The stone is lodged upside down in an alcove, just where it had been placed next to the sewer line centuries ago. I bent down and turned up to take a picture of the neatly chiseled Hebrew words. Giuseppe explained that after being removed from it original position in the synagogue, the inscribed stone was purposefully placed next to the sewer to offend the Jews, a common practice in the Middle Ages during times of Jewish persecution. 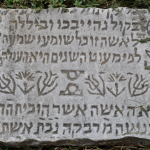 Apparently, this inscribed stone is the only holy writing that remains from any synagogue in Salento (southern Italy), a region once scattered with a number of Jewish communities. Most of these communities, Giuseppe explained, were located near the sea so that in times of increased anti-Semitism, Jews could escape quickly via ships in the harbor. Walking across the piazza in front of the Church of Santa Croce, Giuseppe informed us that the market the Jewish community frequented lay beneath the stones. After making arrangements once again, he led us down a flight of steps through the glass doors of Persone Bistrot, a restaurant in a small portion of a large building. When the work began on the restaurant in 2003 they discovered two separate entrances and more mikvot basins along with channels for bringing in natural rainwater. At the time of the renovation, fresh water still flowed into the pools. 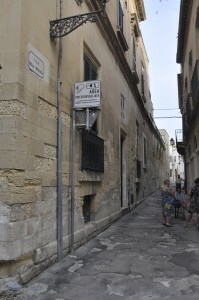 Excavators determined that this marked the site of Lecce’s synagogue as described by the sign outside. In 1495 a mob set fire to the Jewish quarter and killed a great number its inhabitants. The synagogue was demolished and a church was erected on top of it. Later it became a warehouse and then was closed for centuries. 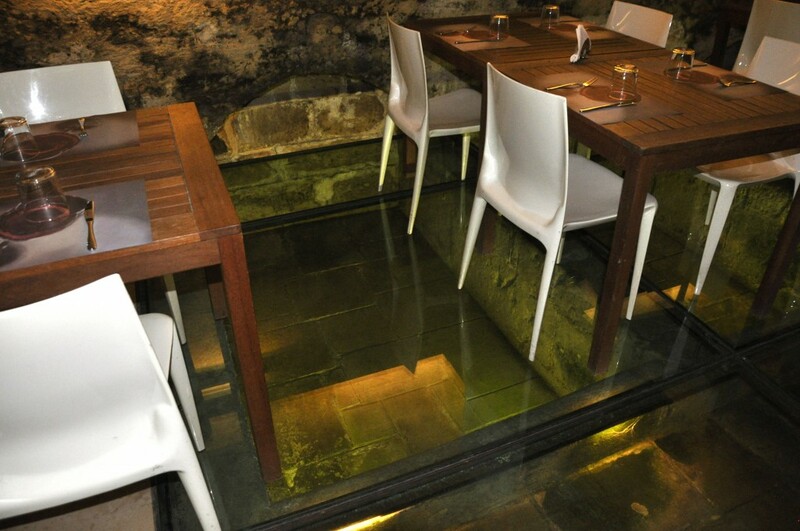 The restaurant designed Plexiglas floors so that visitors could look down and see the excavations. Giuseppe pointed to where a wall separated the women’s section from the men’s (hence the two separate entrances). No one knows how much of the large building covers other Jewish structures and it doesn’t appear that archaeologists will have an opportunity anytime soon to find out. Giuseppe explained that the restaurant manager, Catarina, who had opened the space for us, was fascinated by Jewish history and had been collecting as much information as she could about the original purpose of the building and the lost Jewish community. She asked us if we wanted to see more in the back where only the employees were permitted. 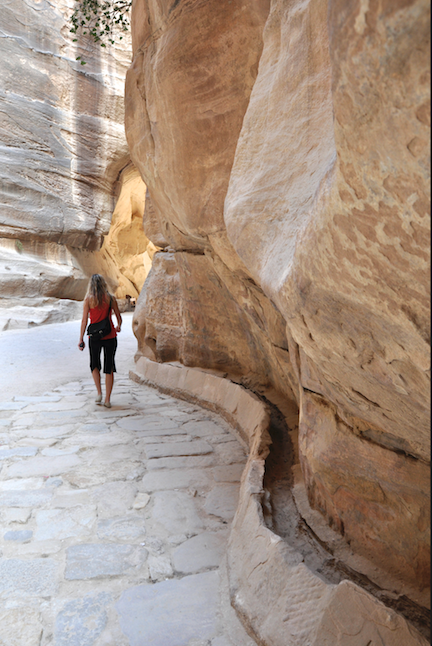 We readily agreed and she slipped us through the kitchen to a stone archway leading down some ancient steps. 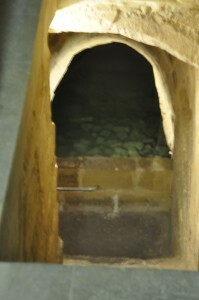 There we found more basins that were presumed to be where utensils were dipped to kasher (make kosher) them. I took a couple of quick pictures before Catarina nervously escorted us out. Later I learned that Catarina would have gotten into a lot of trouble if the owner of the restaurant had discovered that we gained access to the restricted area. Although Giuseppe had heard about the additional basins in the back, he’d never had the opportunity to see them. Once outside the restaurant, he implored me to send him the pictures because, as far as he knew, I was the only one with photographs of that area of the building. I was only too happy to comply with his wishes. I couldn’t think of a better way to show my appreciation for the time he took to show us these treasures. No one knows how much of the large building covers other Jewish structures and it doesn’t appear that archaeologists will have an opportunity anytime soon to find out. Giuseppe led us down Via della Sinagoga and pointed out a bed and breakfast with a sign partially in Hebrew. The owner, Michelangelo, also owns the tobacco shop near the famous church of Santa Croce. For years he had been collecting all the oral legends of the neighborhood and was happy to share his affinity for Jewish history with the archaeologists when the excavations began. He explained that there was a very old tale that a Jewish cemetery lay along Via della Sinagoga. When he began converting an old building into a B&B along the street, he discovered ancient structures under his building. Unfortunately, the government authorities ordered him to seal it up and leave it unexplored. 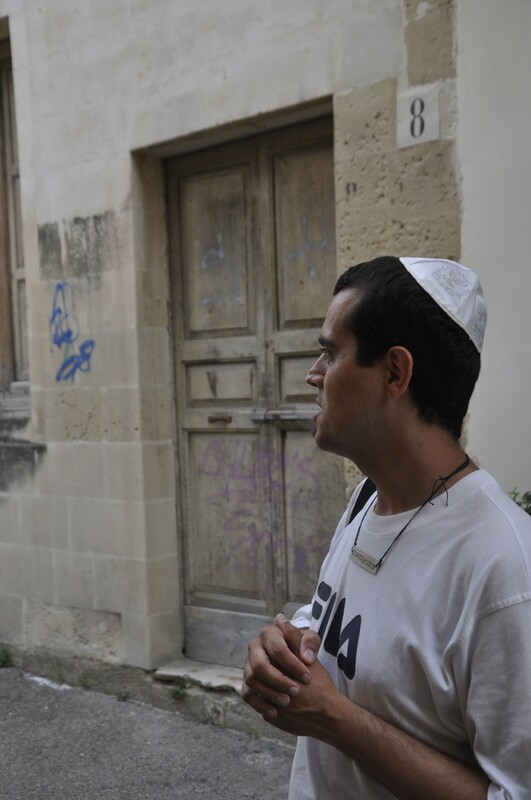 Based on Giuseppe’s description of the political climate of Lecce, I’m guessing that the Hebrew sign outside is a non-verbal protest against those in the community who do not want more Jewish sites uncovered. Right next door to Michelangelo’s little hotel is building #8 on Via della Sinagoga. We learned that the community considered it cursed because of a long history of tragedy associated with the structure. For example, during the Fascist period, this location housed a fencing school and over a period of time, the footwork loosened the flooring. One day it collapsed and killed all of the fencers. A succession of owners have also met with tragic deaths. Recently the property was purchased once again and the new owner allowed Giuseppe to explore the site. He discovered successive layers of buildings under the street level. The lowest level included a basin of fresh water. If indeed this is the location of the ancient cemetery, Giuseppe speculates that this might have been the funeral house with a bath for the Jewish ritual of washing the dead before burial. Until the owner has the funds for renovation, excavations are on hold and the mystery of the cursed house on Via della Sinagoga will go unsolved. I hope all ends well for the new owner! Though only a tiny portion of this area of Lecce has been excavated, the discoveries indicate a relatively large, well-established Jewish community lived here until 1495. There is evidence that Jews began to return to the port city in the 1800’s. Then once again during the Fascist era in the 20th century, the Jews of Lecce disappeared along with most of the Jews of Italy sent to the Nazi camps in northern Europe. Giuseppe doesn’t think any Jews live in the city even today. I’ve been to the beautiful city of Lecce many times over the last two years, but this visit wins the prize for the most exciting. I write historical fiction but sometimes, real life adventures in history are just as dramatic and amazing. Ever since visiting the fascinating Italian town of Matera, I’ve wanted a bread stamp. Yes, I’m mad about bread but I’m also quite keen on the history of this particular pastoral art of this region of Italy. The oldest part of Matera is built out of caves (sassi) where centuries of families lived along with their livestock. In the 1950’s the Italian government evicted these residents due to the squalid conditions, many of which now live in modern housing up the hill. Local residents still mourn the loss of the sassi community with their rich traditions, one of which was their bread stamps. Women used to prepare the bread loafs at home and then deliver them to the community ovens. To distinguish the loaves belonging to different families, the dough was marked with the unique bread stamp of each household. Today master carvers preserve the tradition although their creations are only ornamental objects now. Some of the stamps depict carved women engaged in various tasks and when I saw them, they reminded me of the women who baked bread for the Jerusalem Temple. I wonder if the ancient Israelites and the early Jewish communities also used stamps since communal ovens were widely used. If, like the bread stamps of Matera, they were whittled out of branches found by shepherds, no evidence would remain of this practice. But if such an artifact could have survived the centuries, that would be the bread stamp of all bread stamps for me. 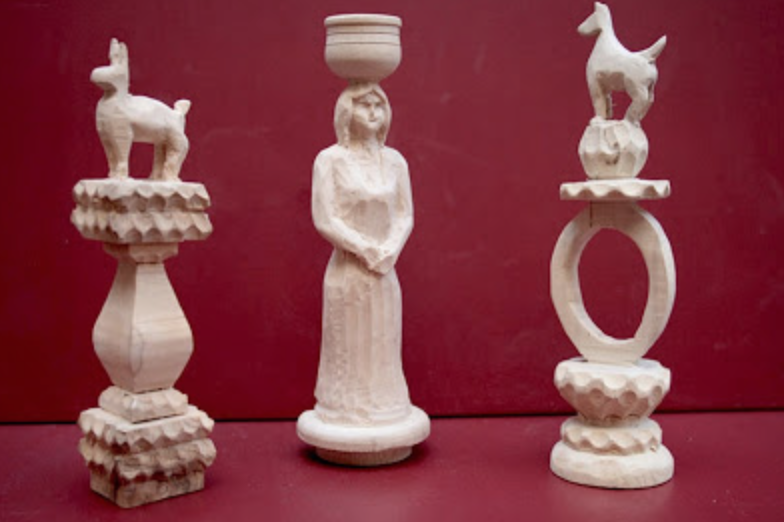 In the meantime, I’m still grappling over whether to spend 150 euro for one of these carved pieces of art just to remind me of my visit to Matera and my musings about ancient Israelite women bread bakers.